Hello! Today I'm back with another 26 Great Nail Art Ideas post. If you missed my splatter mani for the 'Colour Explosions' theme, you can find that post here. This time the prompt is 'The End of Summer', and I believe it is intended to be some of our last summery looks. 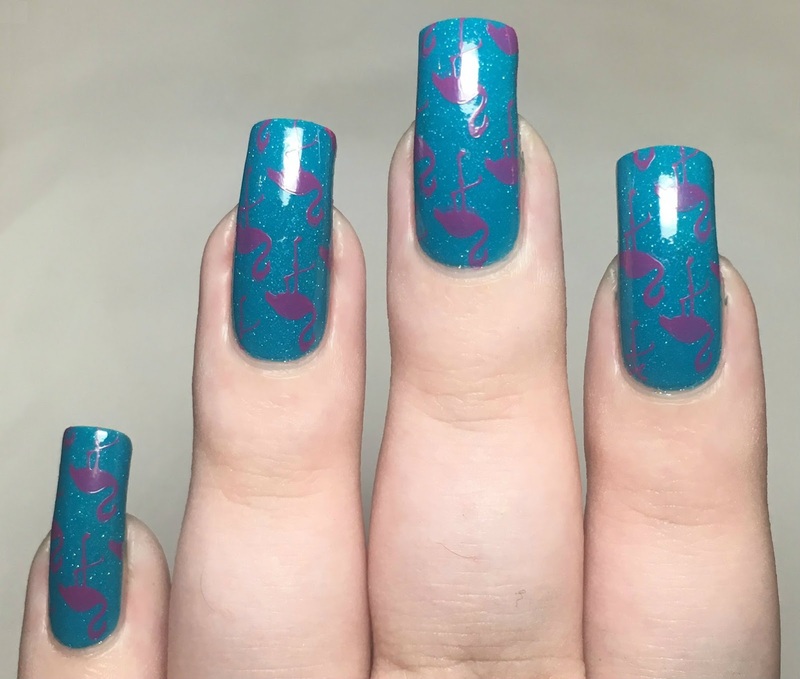 I went for some flamingo stamping using a Born Pretty Store plate. Read on to find out more! I started with a base of Danglefoot Nail Polish 'Atlantis', a vibrant teal creme with scattered holographic. This was actually an exclusive shade to the Which Beauty Box UK Summer Edit, but is available to buy alone here. It has a lovely formula and is easy to apply. Below is two coats with topcoat. Like a lot of teals, this doesn't like to photograph accurately. It is much more green toned in person. 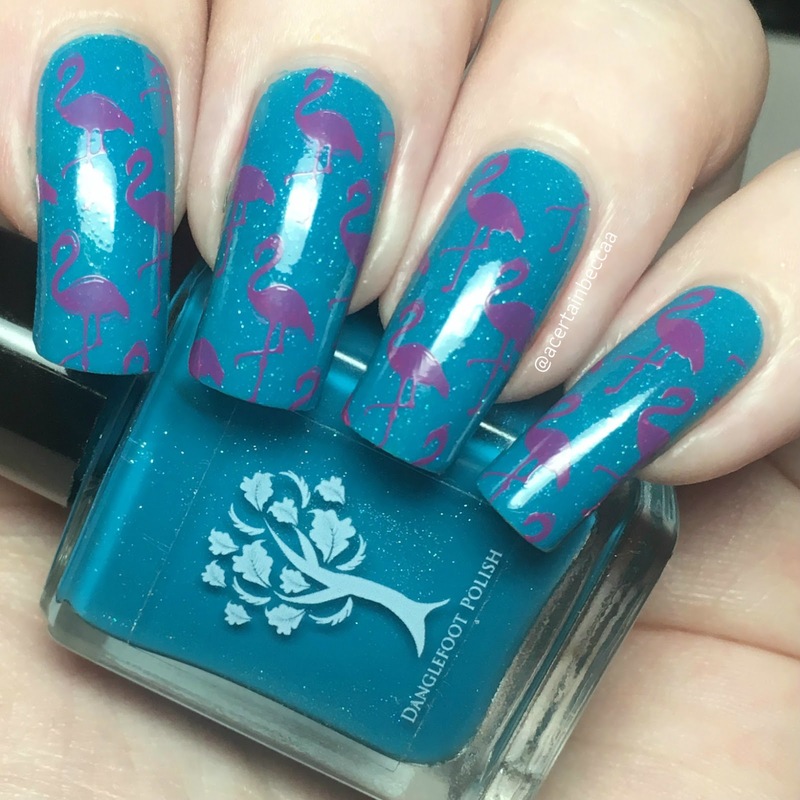 To add my flamingos, I used Born Pretty Store plate BP-L076 (item #40067, online here). This plate is full of summery designs, and has patterns big enough for those of you with longer nails like me. I stamped the pattern over each nail using a Born Pretty Store pink stamping polish and a clear stamper. The plate is etched very well, and I managed to get a perfect pick up each time. What do you think? These didn't come out quite as bright as I had hoped, but I'm still really happy with them. To me it looks like the flamingos are in water, which I quite like! I'm not sure I'm entirely ready for the end of Summer nails just yet though. I am starting to get drawn to darker colours, but I'm still loving brights too.